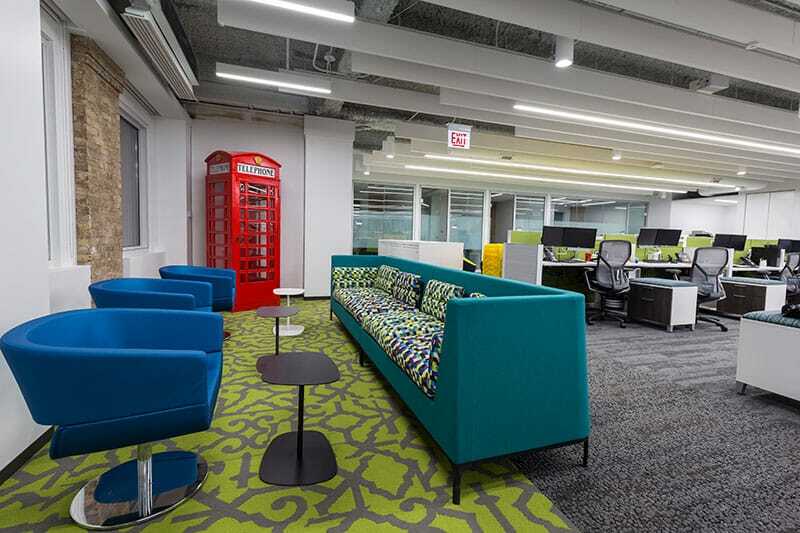 Located in the One Prudential Plaza building, the 22,000 SF project consisted of creative collaborative spaces, high-end finishes and custom artwork for a confidential client. Unique features included custom, solid ash wood slat ceilings with concealed mounting hardware for the west wall, elevator vestibule and main reception corridor. Vertical boards line up with custom ceiling slats to create a railroad look. A custom skyline of back-painted glass was created for the east wall of the elevator vestibule as well as multiple offices and open work spaces. 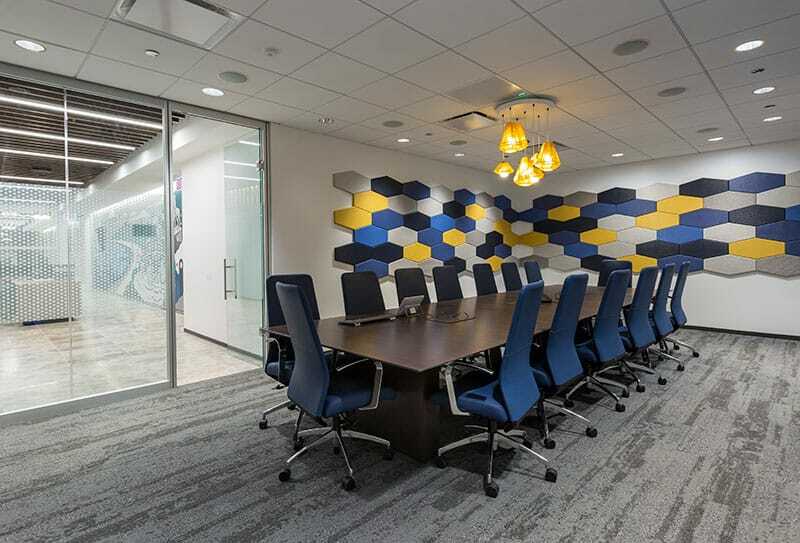 A hexagon-shaped fabric wrapped around the acoustical panels was installed in multiple offices and huddle spaces to provide sound attenuation and add a splash of color to the space. Offices were also designed with All Steel Beyond Wall glass fronts, which provide more natural light in collaborative spaces and connect offices to the open floor plan. One of the coolest aspects of this office renovation was the custom artwork designed for the space. A local graffiti artist was commissioned to paint custom spray-painted murals in the main reception corridor and employee break room. 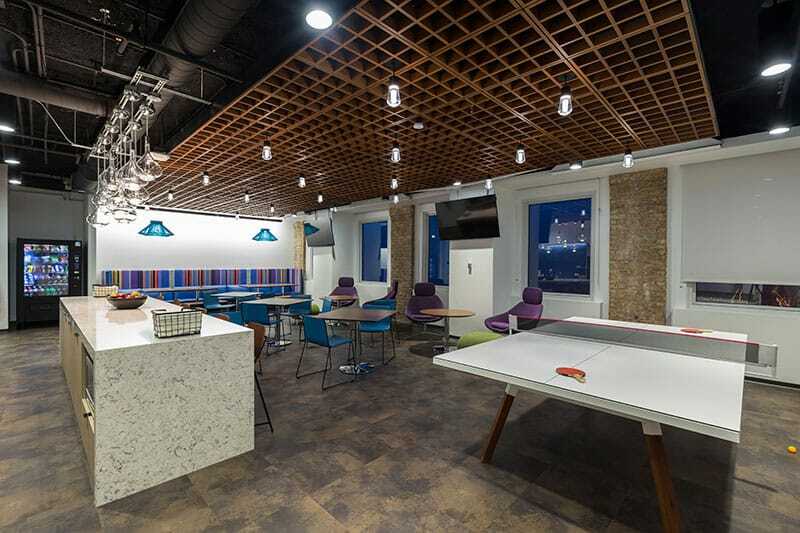 The employee breakroom also has a custom white ping pong table, wood crate exposed ceiling, granite waterfall legs for the island, just to name a few unique features. As a result of this complex build-out, all employees were relocated and consolidated onto one floor. The ultimate goal for this project was to create a workplace that best suited the needs of individual groups, while also enabling the confidential client to work as a cohesive unit and remain flexible in an ever-changing business environment.